The GC & CD Railway is a OO scale British model railway layout designed primarily for scale timetable operation. Located in Victoria, Australia, the GC & CD is based on British prototype from the era 1920 through to the late 1950s. This allows the use of a combination of early diesel locomotive stock and older pre-grouping steam-era stock. 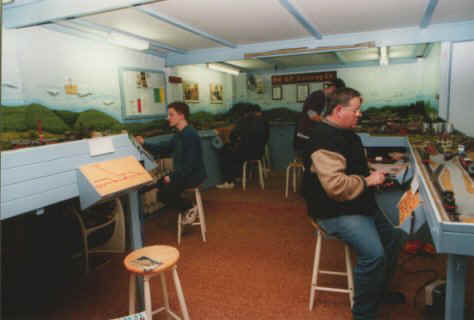 In operation since 1982, the GC & CD has operated most Wednesday nights and has maintained a constant level of dedicated members. This adds up to over 850 run nights and more than 45 work nights, during which everything from complete expansion projects to routine maintenance have been undertaken. In addition to regular weekly runs, the GC & CD Railway has participated in a number of layout tours in the area, and conducts semi-annual "crew swaps" with Mousehaven Railway another local British layout. This site is devoted to our old layout which existed between 1982 and 2004 visit it here. The GC &CD Railway in operation on a Wednesday Night. Copyright � 2001,2010 GC & CD Railway. All rights reserved.